On my wedding day I was too preoccupied to ever be nervous. There was so much to do that I couldn’t even think about things not going right. I was hidden away in a room getting ready and I felt completely secluded from the rest of the wedding preparation. Once my makeup was on, my friends were gathered outside my room, my three layer dress was squeezed into and my hair was pinned just right I opened the door, smiled at all my friends, and soaked in all the ooohs and aaaahs. This was my moment. One and a half years of planning, countless decisions and disagreements but I was about to marry the love of my life and nothing could bring me down. Until my eight year old daughter looked up from what she was working on, gave me a long look, cracked a grin that spread into the mischievous laugh I know dangerously all too well, and started yelling out the lyrics to Frosty the Snowman at me. The moment morphed into a different kind of moment, one that involved numerous glasses of champagne. Life has a way of pounding down any glimmers of greatness you might dare to dream. And not just with one swoop but with repeated thumps that make out the faint beat of annoying Christmas songs. Why is life like this? To keep us humble? To keep us challenged? To keep us hating imaginary snow creatures? When I get excited that new people have followed my blog I realize half of them have the word “viral” or “computer” in their name, half of them are scantily clad women who really want to get to know me, and the rest want me to sell man crates for them. What if my moment is actually right now-In my sweats, laying in bed with my dog drooling on my lap? Is this what life wants me to do? Am I reaching for the wrong moments? Not singing along when I should? Not embracing my inner frosty? Or do I just have to reach harder. 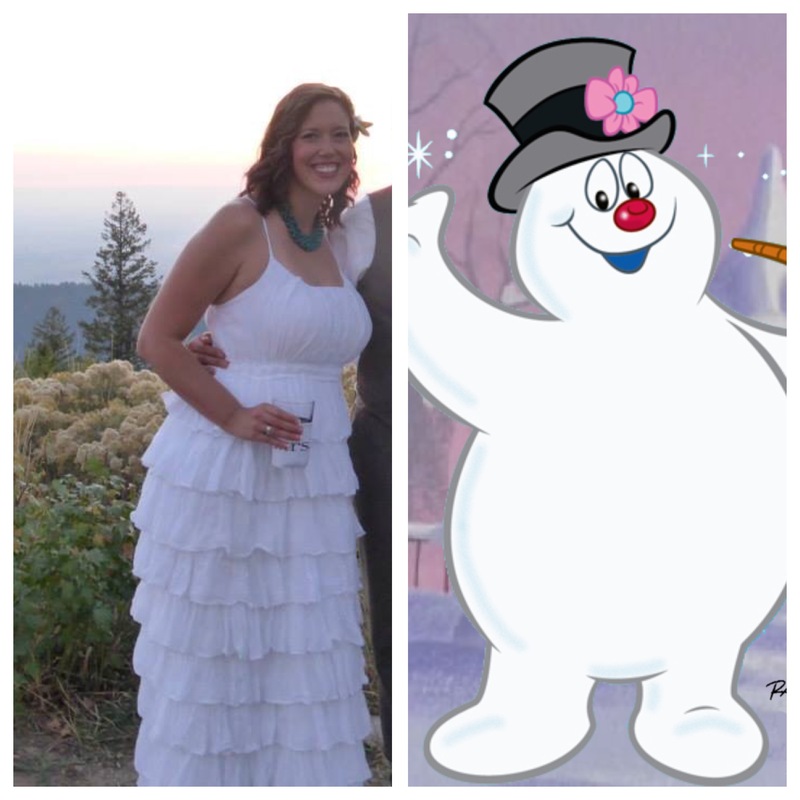 For now, I’m just going to sit back and enjoy this picture of me and my friend Frosty. Forever tied together by a moment that still hasn’t completely melted away. Anytime a bride is also a mother, she is danger of a takedown by her child on the day she planned to be her most glamorous. I think your dress was beautiful and you were beautiful in it. It is SO true. Not much can be about you when you have little ones around. Thank you for your kind words. Nothing like a child to bring us all back to the realities of life. That just cracked me up. Thumpity thump thump. I enjoy reading you! And you were a gorgeous thin frosty bride! Thank you Linda! I am so glad you could be there. Maybe I’m bringing Frosty back! Whole new style. love your perspective on things; so unique to look at life for the simple moments.